You're lookin' good! 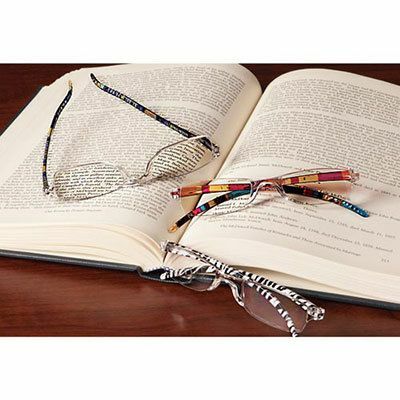 Our bright, colorful reading glasses are full of personality and fun to wear. Have a pair for every handbag, every room. Chic, frameless styling in durable, lightweight plastic. Set of 3 includes multicolor stripe, zebra stripe and blue/green stripe. 5¼"w, 1"h.
They are attractive and do the job, but what I really love about them is that they are so lightweight and durable. These glasses are lightweight and flexible. The three different designs are great! The magnification is perfect, especially for inexpensive readers. I'm wearing a pair as I write this review!